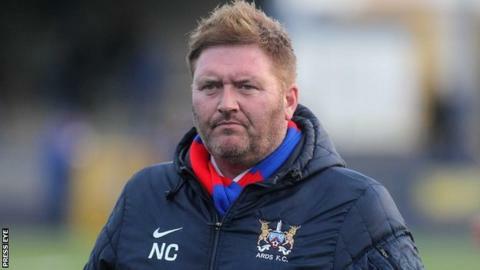 Ards's 1-1 draw at Ballymena United was overshadowed by confirmation that Niall Currie's side have been relegated from the Premiership to Championship One. Institute's 2-0 win over Limavady United, allied with Bangor's 1-1 draw with Harland and Wolff Welders, ensured that Ards were relegated automatically. James McCabe pounced on a mistake by Greg Hall to finish well and give the youthful home side a 12th-minute lead. William Faulkner fired his 10th of the season into the bottom corner on 43. In the second half at the Showgrounds, Graeme McKibbin was forced into saves from Michael McLellan and McCabe. A much-changed United side is expected to take to the pitch for next Saturday's Irish Cup final against Glenavon at Windsor Park. Ards's position at the bottom of the table was already assured, but if Bangor had won their game at Clandeboye Park, they would have been involved in a play-off with Institute.